"Barts The most clear, deep and characteristic pick ups in the world." L’dia on Bass is one of the funkiest bass players on this planet. Marcus Miller's quote about L’dia: “L’dia kills it”. She has about 3 million viewers on Youtube and that has changed her whole musical life. 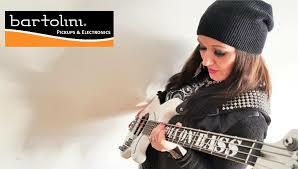 L’dia was called by Fender, Sandberg, QSC, Roland, Elixer Strings and more to be their endorser. Sandberg Guitars recently announced her signature model. As a solo artist and a session musician L'dia has played with Larry Graham, David “Fingers” Haynes (Chaka Khan), Toots Tielemans, Candy Dulfer and many more. She likes to groove!